Standardization is a key element in the design of electronic components. A huge amount of effort and money is saved by having standards for resistor sizes, values, markings, symbols and measurement methods. Although international standards like the IEC (International Electrical Commission) and national standards such as ANSI (American National Standards Institute) are widely accepted, resistor manufacturers often use their own definitions. Therefore it is always important to carefully check the manufacturers’ documentation. Practically all leaded axial resistors up to one watt are marked with the electronic color code (international standard IEC 60062). The resistor color code is a marking system with colored bands that are painted on the resistor body. Together they indicate the resistor value and tolerance. 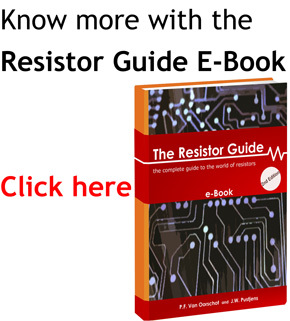 Resistors can have 3, 4, 5 and 6 bands. 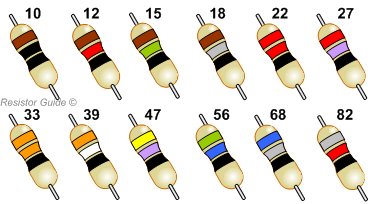 The resistor color code chart is a handy table to decipher the coding system. This interactive tool let’s you adjust a resistor within seconds and returns the resistance value, tolerance and temperature coefficient. It even indicates if the resistor belongs to an E-series (preferred values). SMD (Surface Mount Device) resistors are marked with a (alpha)-numerical code to indicate the resistor value and tolerance. Often these resistors are too small for the resistor color code. Two popular marking systems exist: the 3 and 4 digit code and the EIA-96 code. Soon after resistors became mass produced, a system with preferred values was developed to minimize the number of different sizes that had to be produced. Now preferred values for resistors and other electronic components are defined in the international standard IEC 60063. The preferred values for electronics are defined in E-series. Resistors are manufactured with a certain tolerance. The preferred value system is set up that each the tolerance of each resistor just overlaps with the previous resistor in the series. In this way manufacturing and inventory costs can be reduced. Different E-series, such as the E-12 and E-24, have a different tolerance. Find here the more elaborate explanation of preferred values and a complete overview of tables with E-series. Resistors are available in numerous packages. When designing new circuits and PCBs it is important to know the exact dimensions of the components. The dimensions of the resistor body and the positioning of the leads are often standardized. The leading organization for these standards is JEDEC.